Newton Aycliffe steel business Finley Structures has recruited a new contracts manager from a major national firm. 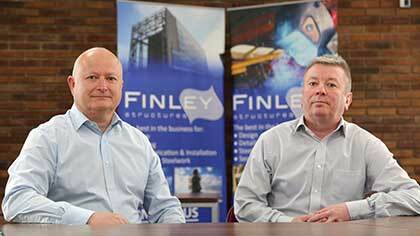 Fred Searle (above, right) has joined the Finley management team after 29 years with Thirsk-based Severfield. Searle, from Harrogate, says the move was made easy because of his longstanding association with a number of key staff already at Finley Structures. He knows the firm’s managing director and founder, John Finley, from his days as a Severfield director. He also worked with Finley’s current operations manager Jim Graham (above left) and commercial director Diane Ruston during their time with the North Yorkshire-headquartered company. Graham joined Finley from Severfield in October 2013 and Ruston followed him North in May 2014. “There’s a 25-year history between me and some of the key personnel here at Finley Structures,” said Searle. “What attracted me to join Finley’s was the working environment and the family-run ethos it has at the heart of the company. Graham added: “Fred and I go way back and we’re delighted to have him on board as part of the management team. Finley Structures has worked on several high-profile contracts in the region over the years. The firm erected the steel for Hitachi Rail Europe’s train manufacturing facility in Aycliffe, and has also built new factories for car manufacturer Nissan and automotive parts maker Nifco in Stockton. Finley also fabricated and erected the steel for Middlesbrough’s Sports Village, Teesside University’s award-winning Curve building and the Redcar beacon, while further afield it helped to build the new multi-million pound shopping development, Victoria Gate, in Leeds. The firm, founded by John Finley in 2000, is currently working on a 960-tonne project to fabricate and erect the steel frame for Hull Venue, on behalf of main contractor Bam Construction after being awarded a string of contracts in the first half of 2017. Other projects include a 283-tonne project to build a new Hilton Hotel in Lincoln for main contractor Manorcrest, a 300-tonne warehouse in Leicester for A&H Construction and a 614-tonne project for Carillion Construction in Sunderland.